What could be a more magical end to a wedding than with rainbows and unicorns? Amanda and Ryan had an incredible destination wedding in Punta Cana of which I got the privilege to attend and photograph. Since the theme was birds and rainbows, a unicorn here and there made the whole thing complete. After having a unicorn pull her carriage to the alter, we decided to have another shoot back home where we could be a bit more creative with no time restraints. These photos are just the tip of the iceberg! Our lovely unicorn model is Beau Dacious (Now referred to as Rain Beau), a former international eventer ridden and handled by Robyn Townsend (who handled him during the shoot and let us dye his hair, big thanks!). Beau spends his days now teaching beginner kids to ride and showing the more advanced kids the ropes to some complicated jumps and maneuvers. 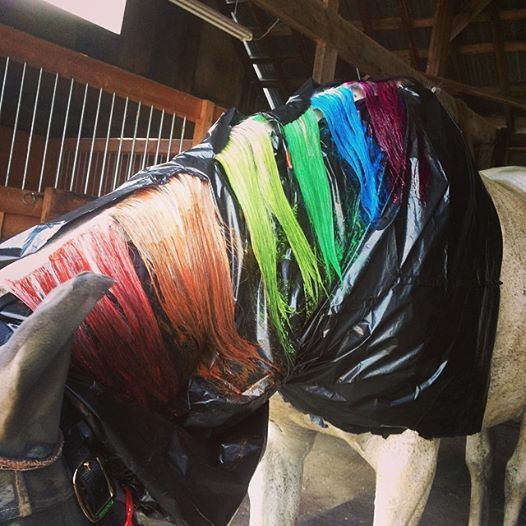 We are sure they will LOVE the rainbow mane. I am however open to doing any creative pre or post wedding photo sessions with any animal of your choice. Trash the dress? I’m in. A behind the scenes photo of Beau getting his hair done, he let us put a garbage bag over his head! Those of you with horses know this is a pretty big deal. Good boy Beau. This entry was posted in equine and tagged L Graveline Photography, Lynda Graveline, rainbow, rainbow wedding, rainbows and unicorns, unicorn, white unicorn. Bookmark the permalink.